This thriving, European-style neighborhood — nestled in a sunny, wind-protected valley between San Francisco's financial district, Chinatown, and Russian and Telegraph Hills — has evolved into one of the city's most unique and authentic communities. North Beach, with the help of planning and zoning tools, has managed to preserve its essential character: a mix of tolerance and tradition in both its built and social environments. 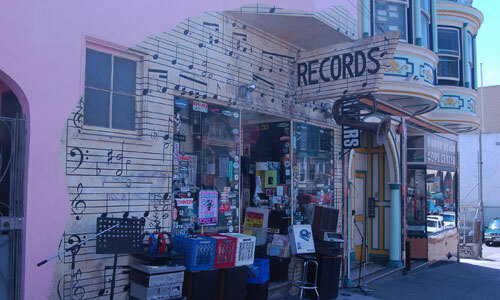 Designated one of the American Planning Association's top 10 Great Neighborhoods for 2007, North Beach attained international repute in the 1950s as the genesis of the Beat Generation. While it remains a popular pilgrimage destination for former beatniks, the neighborhood is anything but a relic. Its eclectic mix of mom-and-pop shops, nightclubs, and polyglot character make it a favorite among residents and tourists alike. Many North Beach streets have urban design and architectural features that create a unique and interesting streetview. Courtesy of Victor Zhang. North Beach is, in many ways, a traditional neighborhood. It's rarely more than a few blocks walk to find a grocer, bakery, barber shop, hardware store, church, school or park. What cannot be found in the neighborhood are chain stores and fast-food outlets. And that's by design. As early as the 1980s, the city placed controls on the type and scale of commercial uses as a way to help protect North Beach's identity. The idea was to promote homegrown businesses and discourage chains and franchises by including in local regulations descriptions of how North Beach businesses could operate. To further dissuade chain stores, the San Francisco Board of Supervisors voted in 2005 to ban retailers with more than 11 stores from locating in the neighborhood. North Beach's identity has been formed over a century or more. Settled in the 1850s, the area's first residents were middle-class Americans. Thirty years later, two-thirds were immigrants, mostly from Ireland, Germany, and France. By 1939, more than 60,000 Italians had moved to this square-mile neighborhood, earning it the nickname of Little Italy. The streets were lined with Italian restaurants, shops, and social clubs. Tourists frequented the area, drawn by the quality and affordability of the local cuisine. People relaxing in Washington Square Park. Courtesy of wikipedia. With the 1950s came an influx of beatniks who filled jazz clubs, coffee houses, and esoteric bookstores. Nightclubs along Broadway hosted top entertainers. Today you can find boutique shops and restaurants mixed in with dance clubs and risque venues, making North Beach a neighborhood of contrasts and one of the liveliest parts of town. Part of North Beach's appeal stems from restrictions on building heights and billboards that were prompted by neighborhood associations and implemented in the 1980s. Today, historic landmarks such as Coit Tower are visible; no skyscrapers block the view. 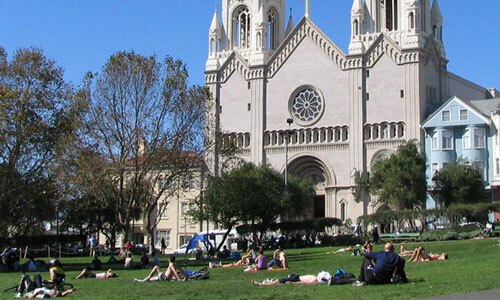 Washington Square, the neighborhood's central open space, is a place for morning Tai Chi classes, dog walking, sky gazing, and several annual festivals. Affordability — both residential and commercial — remains an issue in North Beach. Roughly 60 percent of the housing stock is rent controlled. An inclusionary housing program requires that new developments set aside a certain percentage of units as affordable. For example, the 341-unit North Beach Place apartments, which replaced crumbling 1950s mid-rises, opened to acclaim in 2004. This mixed-use project contains 34,000 feet of street level retail and a mix of residential units: public housing, low- and moderate-income, and senior citizen. 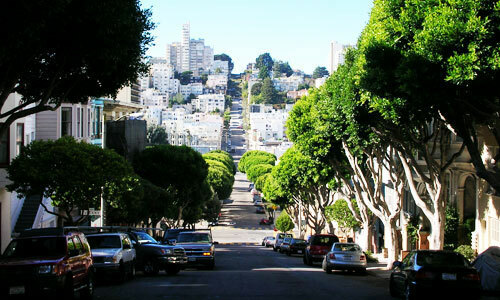 Mature trees line the streets of North Beach. Courtesy of Shutterstock.